This Friday I am having a Dinner party for my friends who are moving :( Sad that they are leaving… but excited to host a dinner party! It is going to be super casual, we are having a Taco Bar with Fresh Mojitos and Tres Leches! Pics and recipes soon to come…. I need to get to work on some stuff for the Dinner Party, so meet the Framed Tablecloth. This couldn’t be easier! 6 yds. of quilt binding. Only 2 “ingredients”! The binding usually comes in 3 yd packs and it is about $2.00 a pack from JoAnn Fabrics. I found this amazing floral fabric at Garden Ridge Pottery of all places and it was $3 for 3 yards! I think I might make half-curtains for our kitchen out of the extra fabric. 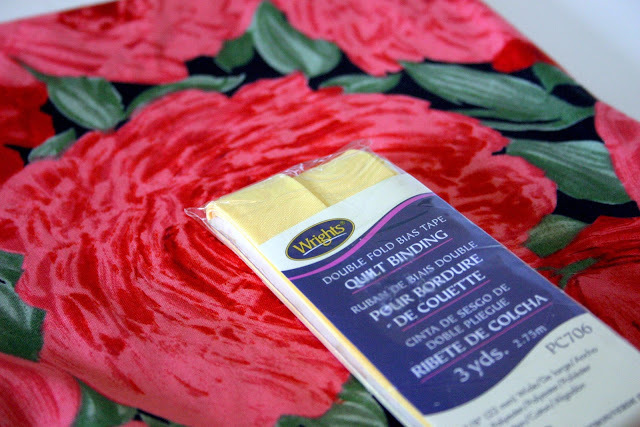 I like to mix colors, so for the binding I got a buttery yellow. 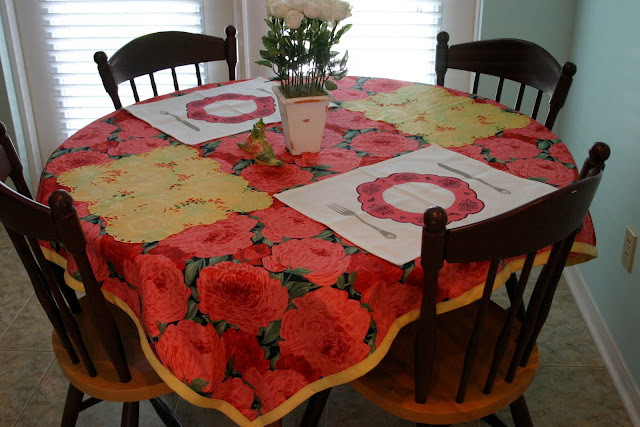 All you have to do is attach your quilt binding all the way around. 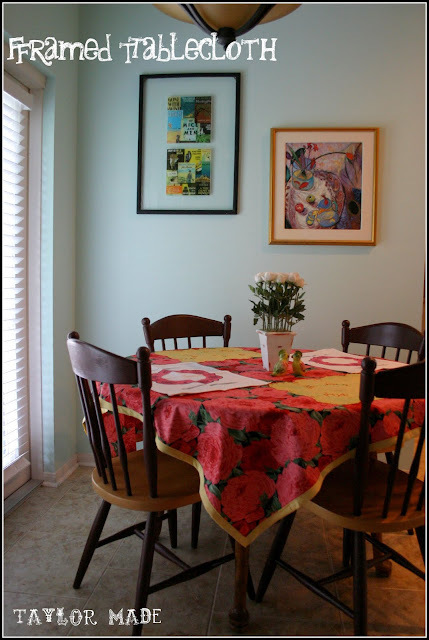 There you have the Framed Tablecloth, custom made and under $7.00! Looking at the picture of the Tablecloth laid out makes me think that it would be super cute as a picnic blanket! Too bad I live in Houston and it is 200 degrees and I hate being outside… but it would still be cute. Now I need to get to work on my never ending to-do list! Wish me luck!